We are supplier of different types of Woven Wire Mesh such as Crimped Wire Mesh and Square Wire Mesh and many more at competitive prices. 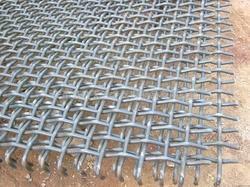 We also offer wire mesh fabrication. We are manufacturing, exporting Hot Mix Plant Wire Mesh for Apollo, Speco, Asphalt. 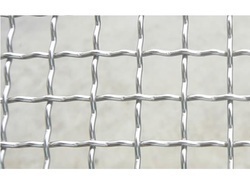 Wire Mesh is made up of high quality material which ensures improved life of the Wire Mesh. We providing high quality Spring Steel Wire Mesh meeting all the International Standards that meets global standard and specification such as, We provide Steel in brilliant finish and sheared edges to suitably allow bending and molding in desired springs. Our Steel undergoes heat treatments to ensure durability and hardness. 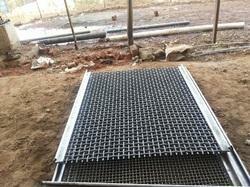 The Square Wire Mesh or Supporting System is also used for sieving purpose. This Screen Cloth is manufactured with or without Side Panel and sometimes provide support to fine wire-mesh in screening and separation work. Made of Spring Steel (high and medium Carbon Steel), Stainless Steel available in all grades and any other desired metal. 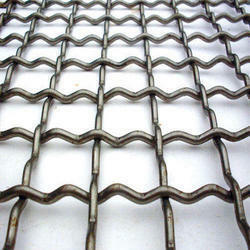 The Crimped Wire Mesh is used in industries where sieving is prevalent. These screens are generally put in series in order to generate and separate the finest particles of Chemicals, Fertilizers, Cement And Pharmaceuticals. These are made up of good quality raw materials and have got a long life. The Crimped Wire manufactured by us are made out of low and medium Carbon Steel, Galvanized Steel Or Stainless Steel, MS, G-1, Copper, Brass. These wire mesh are used in industries for filtering, sizing, grading, separating, shifting and have got domestic use as Grid Window, Rack, Lift, Cages, Guards, Trays, Partitions and many more. Working with a belief to make our customers satisfied, we have brought forward a range of Knitted Wire Mesh under our product gamut. Taking quality as our prime concern, we maintain the quality of our entire products range and offer the same to our customer’s at most reasonable prices. Backed by a team of experts, our Knitted Wire Mesh is finely processed using advance technology. Moreover, our valued customers can avail all our products range at reasonable rates. Knowing us a renowned organization, we are engaged in offering an extensive range of Self Cleaning Wire Mesh to meet the demands of our clients. 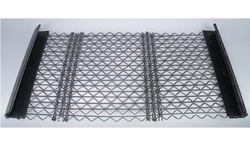 This Self Cleaning Wire Mesh is designed by the team of well qualified designer and processed under the strict supervision of experienced team-members. We deliver our assignments using customized packaging. Furthermore, our offered range of products is availed in various specifications, as per the varied needs of our valuable clients. Owing to the presence of our expert team members, we are engaged in catering a wide range of Intermediate Crimp Wire Mesh under our product range. Our offered range of Intermediate Crimp Wire Mesh is available at market leading prices along with unmatched quality. Our entire product range is processed under the strict supervision of experts, using the high grade technical skills and advanced machinery and other related equipments. Keeping in mind the diverse requirement of our clients we are involved in offering a wide gamut ofDouble Crimp Wire Mesh. Our ranges of Double Crimp Wire Mesh are extensively used in different industrial sectors. They are excellent finished during the whole processing in our organization. We are considered as one of the trustworthy and prominent organization of this industry, due to our utmost efforts for maintaining the quality. Furthermore, our products range is available at market leading prices. Taking quality as our prime concern, we are engaged in offering Intermediate Wire Mesh to the customers. Backed by a team of experts, these are processed using optimum quality material and advance technology. Furthermore, this Intermediate Wire Mesh is availed in various specifications, as per the varied demands of our valuable clients. Moreover our clients can avail this product from us at industry leading prices. With firm commitment to quality, we are engaged in offering our patrons a broad assembly of Iron Wire Meshes. 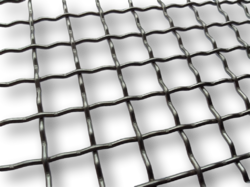 The offered iron wire meshes are steel reinforcement material in concrete. These iron wire meshes are used for the purpose of replacing the traditional "cut & bend" and placing of steel thermo-mechanical treated bars. Patrons widely appreciate our offered iron wire meshes as these have longer service life, resistance against corrosion and flawlessness. 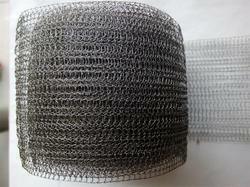 Woven Wire Screen Cloths are highly suitable for screening various materials. It is available in different mesh sizes, wire diameters and apertures to meet the specific requirements of industries. 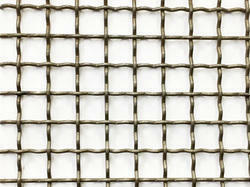 Looking for Woven Wire Mesh ?